Turning 18 is a significant milestone, it also means you can enjoy a cold alcoholic drink responsibly! It needs to be remembered with something special so surprise your guests with a personalised stubby holder. We've loads of stubby holder designs to suit those born in the 1990s. From funky artwork to a stylish elegant look we've catered for a wide range of styles any 18 year would love. And as every one can be coloured in any way you like there are even more options. Following are our templates for 18 year olds - however you can use any other design from our website (not just birthdays either - we've converted many wedding design to suit a birthday too!). We can change the '18th' year to any year you like! Colourful and contemporary birthday stubby holders for any 18th birthday occasion. Fun and funky design that suits a wide variety of birthday ages. Colourful stubby holder to suit the surfing 18 year old. Punchy rainbow background that looks even better when printed on your 18th birthday stubby holders. Simple, popular grunge design stubby holders. Can easily be modified to suit a female recipient. ...and another grunge stubby holder design with a more girly twist to it. Elegant, basic design that creates some very stylish birthday stubby holders. A slight alteration of the previous design - this stubby holder design looks great with a coloured background too. A slightly 'aged' font and contemporary typography make this one of our most popular stubby holder designs. Another just text design - these make excellent choices if you are unsure about what to get - even better if you can just get their favourite colours - all these stubby holder designs can be changed of course. 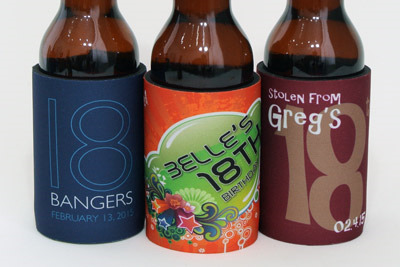 Modern and stylish stubby holders for the discerning 18th birthday boy or girl. Fun, balloon background birthday stubby holder design for an 18th. A stylish, almost Art Deco, design for a female 18th. A stylish photo works really well on this stubby holder design and we can convert any photo to a B&W shot here if you like. A little bit of Hollywood pizzazz to this stubby holder design for a feamle 18th birthday. A variation of a previous stubby holder template - the more modern font and contrasting colours can give quite a different look. Looking like the door number on a V8, this stubby holder design can be adjusted to suit your favourite V8 Supercars race team. Get the birthday boy or girls name on their own AFL guernsey stubby holder! We've made up this years Premiers, the Hawks, but we have every other teams colours made up and on file, so just let us know what you'd like when you order and we'll send you a proof.